Current downsizing trends have created buyers that are seeking streamlined homes that make better use of space, are highly energy efficient, and require lower maintenance enabling more time for enjoyment of life. A secure environment that’s aesthetic, inviting, and presents the lifestyle and amenities you want. With this in mind, Hawks Landing is the perfect place to consider investing your future. 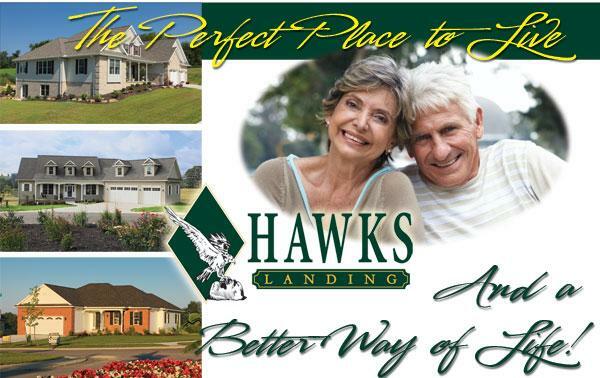 Our highly popular development, Hawks Landing in Berlin, Ohio, provides the ideal backdrop to peaceful country living. This charming neighborhood is conveniently located at the edge of Berlin, yet is nestled in the midst of rolling hills and charming countryside. The Hawks Landing community serves today's buyer's increasing need for more affordable housing by providing a low-maintenance, high quality home without sacrificing amenities or aesthetics. The smaller yard means less mowing with more time for gardening and home enjoyment. Hawks Landing offers a more simplified lifestyle that today's mature, educated buyer is seeking in a geographic area conducive to that life style. It's not unusual to see residents at Hawks Landing enjoying their coffee together or taking an early morning brisk wake-up walk through this beautiful development. It's the kind of place that attracts that type of person. With Hawk Landing's professionally landscaped grounds, it's a welcome drive whether you're leaving or arriving - every time. Sometimes, as you age, you find that for you to continue to stay in your home (or have your home work for you), you need wider hallways, handicap accessibility throughout, cabinets easier to reach and open, and more. Ivan Yoder Builders is equipped to accommodate whatever your needs are so you can continue to live in your own home. See plot plat of Hawks Landing community to the right. Image shows Phase V opening spring 2018. Call for pricing information on this final Phase of Hawks Landing. Lots shown in orange are specs/models, lots shown in green are sold, and lots shown in yellow are available (lots in light green are Phases 1-3). To see interior and exterior photos of the homes in Hawks Landing, click here. 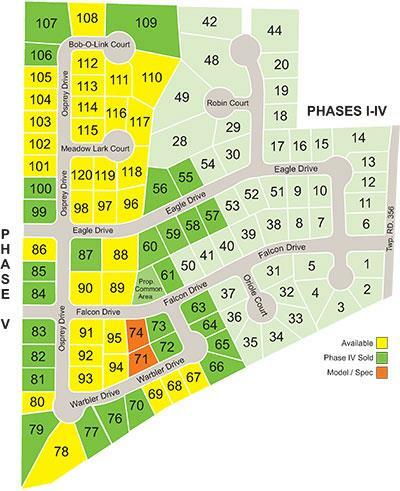 Below is a pdf of the current pricing and availability Phase IV & V of Hawks Landing. Please note that lot pricing is subject to change.